Eddie Perez surrounded by supporters Thursday night. By turns contrite and defiant, Eddie A. Perez launched a populist campaign for mayor of Hartford on Thursday, attacking the downtown corporations that once backed him and testing the notion of whether Connecticut’s capital is ready to join its largest city, Bridgeport, in returning a corrupt former mayor to City Hall. Three weeks ago, a Superior Court judge stripped Perez of his city pension, saying his bribe-taking, “self dealing and disdain for the public good” while in office nearly a decade ago, outweighed his good works. 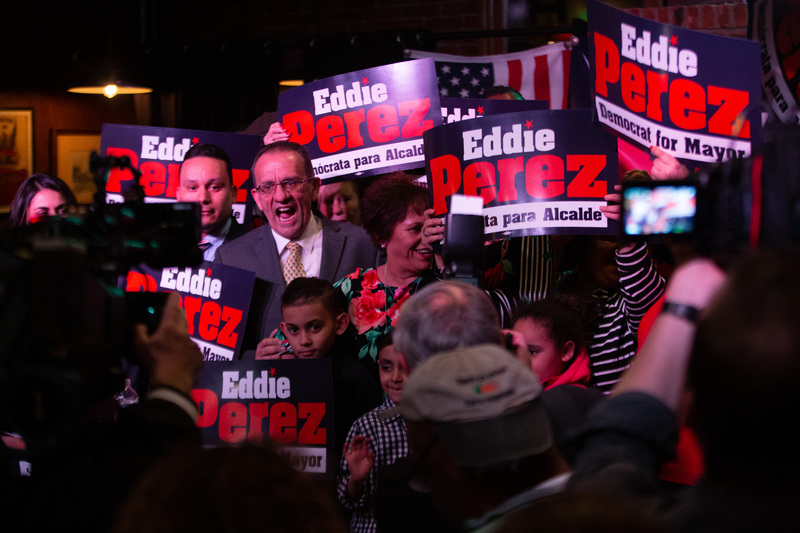 On Thursday, Perez called his redemptive campaign a step on a journey inspired by a merciful God. If successful in his challenge of Mayor Luke Bronin, two of Connecticut’s four largest cities would be led by Democrats convicted of corruption. Bridgeport Mayor Joseph P. Ganim, who served seven years in a federal prison in connection with the systematic extortion of city contractors, was elected mayor in 2015. But Perez is not Ganim, and Hartford is not Bridgeport. Perez lacks the formidable retail political skills of Ganim, and Ganim plotted his comeback with the assistance of Mario Testa, the long-time political boss of Bridgeport. Marc DiBella, the Democratic chair of Hartford, is keeping his distance from Perez, as is the city’s legislative delegation, including the three lawmakers who represent Hartford’s Puerto Rican neighborhoods. 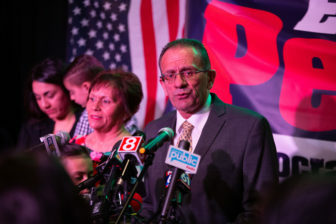 Perez was born in Puerto Rico and came to Hartford as a 12-year-old in 1969. His election in 2001 made him a celebrity on the island, a symbol of success by the Puerto Rican diaspora, the islanders who left for a mainland that now has as many Puerto Ricans as Puerto Rico. While 44 percent of Hartford’s residents are Hispanic or Latino, according to latest census estimates, the city’s Puerto Rican neighborhoods generally have the lowest voter turnouts. Perez has hired 35-year-old Jason Ortiz to manage his campaign and build a grass-roots organization capable of turning out that vote. Much of the development aid spurring downtown housing development comes from the state. “If we took 50 percent — 50 percent — of the money and support that we put into the central business district and to the interests of the corporations in our city and put that money in small businesses on the Main Street — Albany, Franklin, Park Street, Wethersfield — we will have a whole new city,” Perez said. Bronin’s campaign ignored Perez’s criminal record Thursday, reflecting a conclusion that Bill Finch, the Bridgeport mayor unseated by Ganim, should have focused on Ganim’s performance in office and not the scandal that sent him to prison. Bronin’s senior campaign adviser, Conor Hurley, said Perez was a failure as mayor. With major regional hospitals, state offices and four colleges, about half of Hartford is tax-exempt. The median household income of $33,841 is less than half the statewide median. About 30 percent of the city’s 123,400 residents live in poverty, and the city has one of the lowest percentages of home ownership in the U.S.
Bronin, a former general counsel to Gov. Dannel P. Malloy, was elected in 2015, unseating Pedro Segarra, who had succeeded Perez. Bronin took office as the city struggled to avoid defaulting on its debts, clashed with unions as he cut expenses, and then infuriated many supporters by exploring a run for governor in 2018. Perez made clear he would be using Bronin’s ambition against him, saying the mayor’s office was more than a place to build a resume. “Hartford is not for sale, and Hartford shouldn’t be a resume builder,” Perez said. Under a debt assistance deal struck with Malloy, the state will pay off Hartford’s general obligation debt of about $534 million over the coming decades. The deal helped stabilize the city’s finances — and brought an end to Bronin’s gubernatorial ambitions, at least for 2018. When asked if he could have delivered such aid, Perez smiled and said Bronin had a helpful “uncle” in Malloy at the Capitol. Perez was elected to a two-year term as mayor in November 2001, backed by a corporate community that had come to accept his argument that Hartford needed to shed its council-manager government in favor of a strong mayor — and that Perez was the man to lead that transition. A year later, Perez convinced voters to approve a new charter that would give the mayor authority to hire and fire department heads, fixing accountability in one elected office for the first time in the city’s modern history. In November 2003, Perez was elected to a four-year term as the first mayor under the new charter. A one-time gang member, Perez helped found an important community group, ONE CHANE, as a Vista volunteer in the impoverished North End. His springboard to city hall was a job at Trinity College coordinating the development and construction of the Learning Corridor, a $126 million campus of magnet schools on the site of an old bus depot. Perez, now 61, was forced to resign in 2010 after his arrest on corruption charges. He was convicted at trial, but the conviction was overturned on appeal. He avoided a new trial by pleading guilty in August 2017 to receiving a bribe and criminal attempt to commit larceny. He was sentenced to probation. 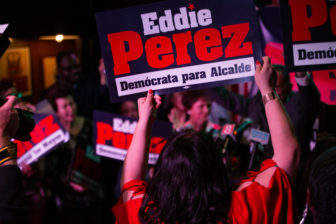 A Perez supporter announces her allegiance during his announcement Thursday night. Perez saved a contractor from being kicked off a $5.4 million project to install sidewalks on Park Street. City officials had concluded that the contractor’s work was substandard. The contractor later did renovations worth $40,000 at Perez’s home. Superior Court Judge Cesar A. Noble was harsh three weeks ago while granting a request by the state attorney general’s office to strip Perez of a $27,945-a-year pension. “The severity of the crimes, the self dealing and disdain for the public good demonstrated by his conduct, as well as the high degree of public trust reposed in the defendant, outweigh any factors mitigating his crimes including any good work done for the city, the financial impact on the defendant and his wife or her illness,” Noble wrote. Perez’s lawyer had asked the judge to consider the impact on the former mayor’s wife, Maria, who has had to return to work after a brain aneurysm. Perez now makes about $45,000 a year as the transportation coordinator for Capitol Region Education Council, which oversees regional magnet schools. Another challenger for the Democratic mayor nomination, state Rep. Brandon McGee, also is employed by the council, known as CREC.